Caravanning Aussies are going the distance to bring the comforts of home on their travels. The lines between home and ‘home away from home’ are beginning to blur in 2018. With the likes of powerful solar powered batteries, generators, fridges, lightweight awnings, washing machines, air conditioners and more becoming the norm in modern caravans, all the comforts associated with home are at the fingertips of Aussie caravanners. Today the number of lifestyle luxuries on offer to leaves little to be desired. Hot showers keep travellers comfortable in the cold, while slimline air conditioners have become essential during Australia’s sweltering summers. strive to create the most comfortable home on the road possible. comfort products is only enriching the caravanning experience of Australians. “At Aussie Traveller, we are not aiming to provide the most luxurious options. We work with our customers to find their pain points, and then create solutions to enhance the caravanning experience without spending a fortune,” Mr Freney said. conditioners, generators and more for over 30 years. With highly experienced sales and support teams across Australia, Aussie Traveller provides exceptional service, fast delivery and strong after-sales care. 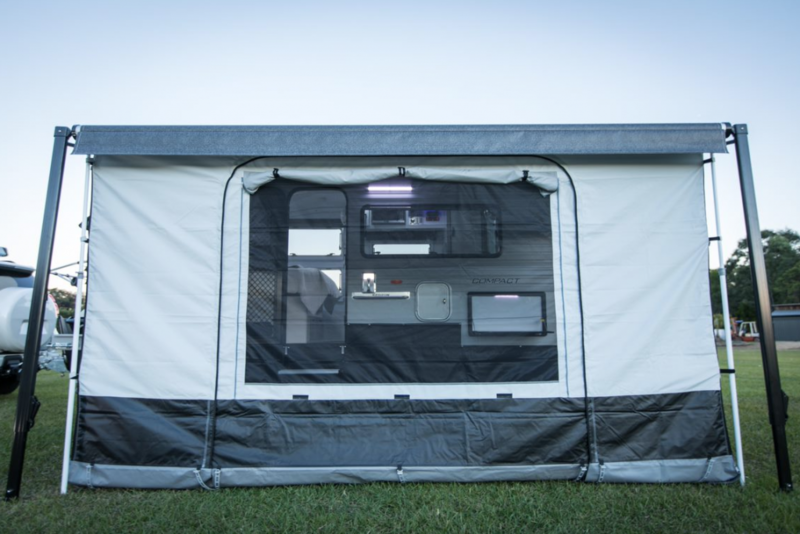 Aussie Traveller is the only Australian manufacturer with the ability to custom-make awnings to ensure caravan owners have the best fit to suit their needs.